About 10 years ago (maybe more), I was given this old shotgun. Well, most of a shotgun. Or, what's left of it anyway. It was found in the trunk of an old 1963 Rembler that someone was about to junk out, so my buddy bill grabbed the gun and later gave it to me. 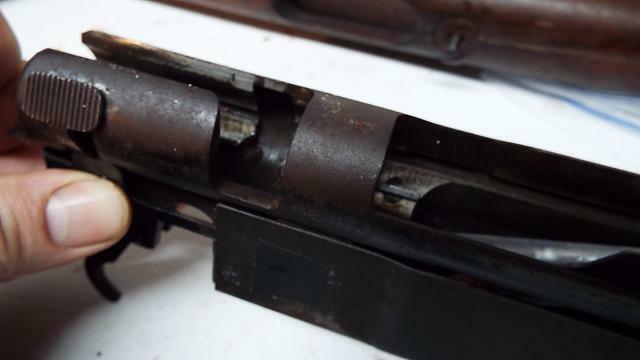 The old gun had a stock cracked entirely in two all the way back behind the trigger to where the handguard is. Was missing the bolt stop screw, an extractor, extractor plunger, extractor spring entirely, the other side had a broken extractor. Later, found out that I needed to replace the magazine spring, had to redo the front sight bead with a larger one. 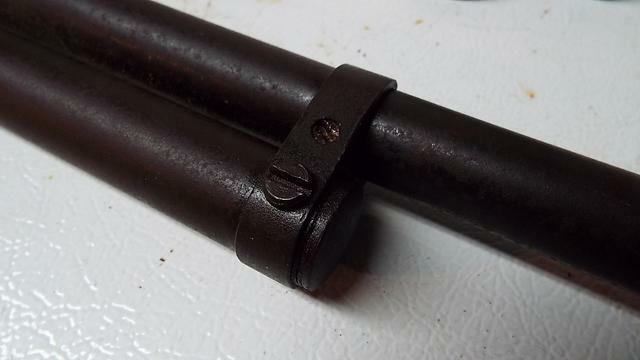 I ended up making a barrel band around the front to help take some of the force off of the old broken stock until (if) I can find a replacement for it. 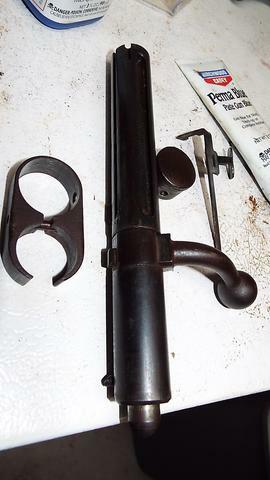 The gun had an orange peel layer or surface rust which cleaned up really well with some sandpaper and a nice dark coat of birchwood casey cold blue. After a lot of TLC, was able to get a new coat of blue on the receiver, bolt, barrel and mag tube. 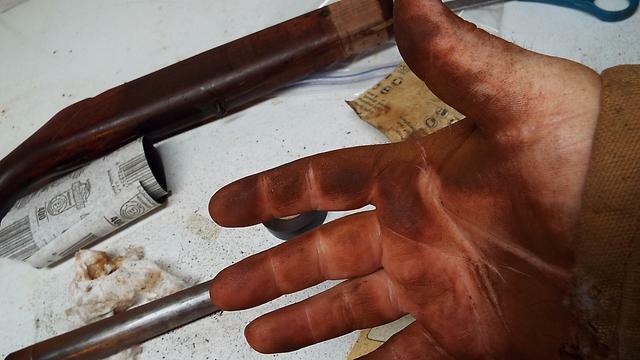 This old gun has a lot of carbon steel in it because it blued very dark in just a single coat. Just more proof that they don't make stuff like they used to. From everything that I can tell, this particular gun was made sometime between 1946 and 1948 based on the model number designation. But since it had no marking indicator for FIRE, I drilled small dimple and color filled it with red testors model car paint. 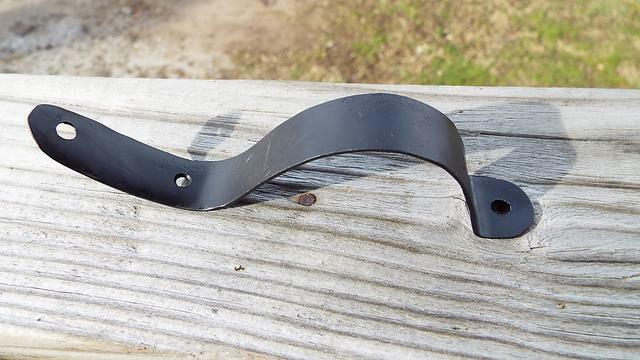 My youngest son helped make a trigger guard for it. I thought I had a thin piece of sheet steel in my shop, but I didn't, so we flattened a piece of thin aluminum tubing into sheet, cut it out, and formed it to the shape we wanted. Considering that he's just 12 years old, I think he did a really good job with it. I know it doesn't look exactly like the one that came on the gun, but I don't care. I love it just the way it is and I wouldn't take a hundred dollars for this trigger guard. He even rolled the edges to form to the stock better. A quick picture of the gun once we got humpty dumpty back together again. And a couple of quick videos with the first shots it has seen in decades. This is before I had both extractors, so it's not ejecting the empty shells. And a short video after I got all the parts in the gun. It's working pretty dog gone good now. At least it isn't laying in pieces of a pile of scrap in my basement anymore. Got one..... 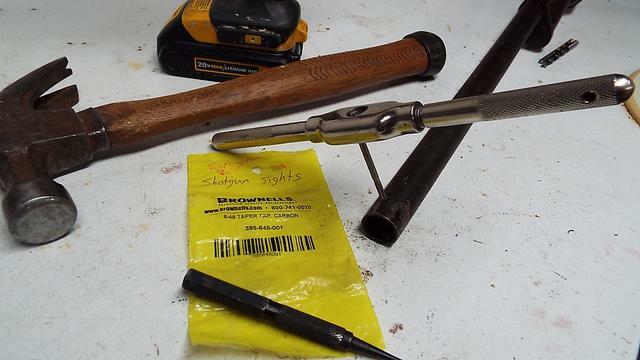 I drilled and tapped for a Mauser peep sight, cut off the full choke and made it cylinder. It's good out to 100 yards with rifled slugs. BTW this shotgun is a lot more robust then you might think. Yeah, the gun itself seems pretty robust. At least the receiver and the barrel does. I'm having a few issues with the magazine tube wanting to walk forward after you fire a bunch of shots. 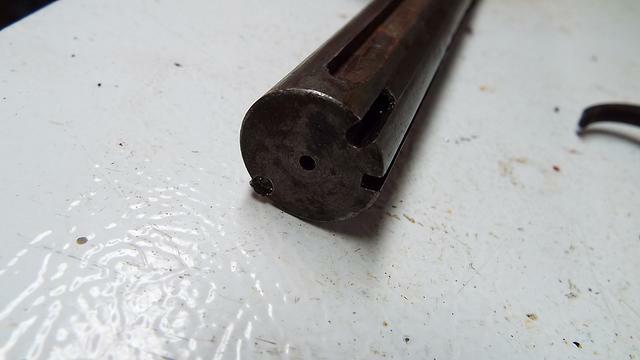 I think it is due in part to the clamp that wraps around the barrel and I think it's the "swelling" of the barrel when a shot is being fired that tries to push it forward. 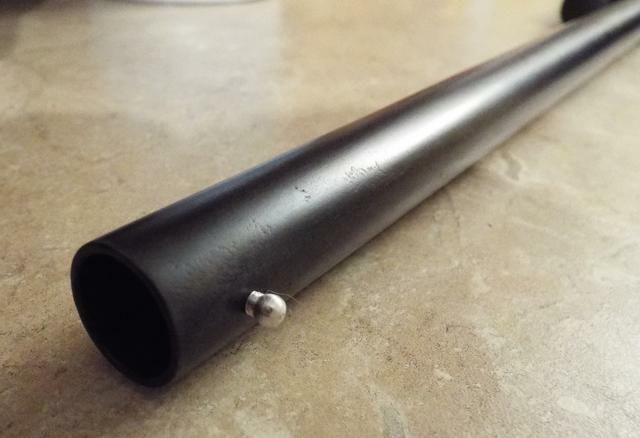 I have even considered tack welding the mag tube in place or perhaps drilling and tapping it, though I don't really want to do that either. If I did tack weld it, would be in the back of the clamp and on the bottom of the barrel where it would be hidden by the stock. My main concern about the integrity of the gun is the wooden stock though. It needs replaced but I've not seen an affordable replacement for it, so I epoxy glued the stock for the time being to see if it lasts until I do find a replacement. 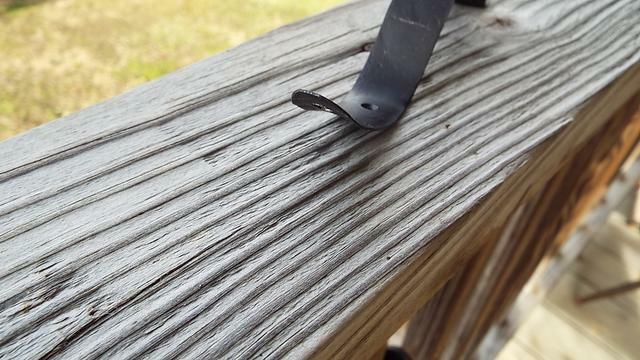 I did make a barrel band from a piece of kydex though just to take some of the pressure off of it the single stock screw that holds everything together. But the gun itself is a really tight shooter. Especially with #8's. 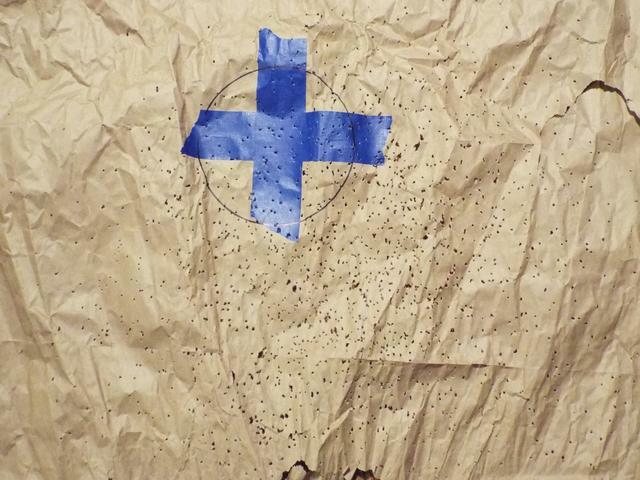 The barrel is marked as a full choke, but when I checked it with a set of calipers, it clocked in between an extra full and turkey choke ~.686"
Here's 3 shots that I took just to see where it was patterning. 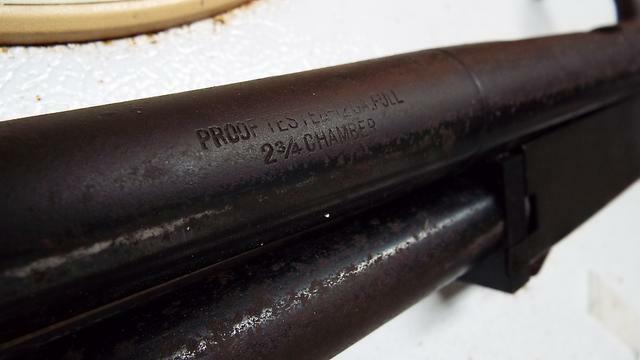 I never had ANY interest in bolt action shotguns after I got rid of the one I had over 60 years ago, but I do remember a bunch of Sears ones were recalled because the bolts were coming out on firing. I believe those used a bolt/screw as the bolt retainer, but you may want toi check. From everything that I could tell, only one variant of these were recalled and there were about 6 different revisions. There were about 4 other models after this one. 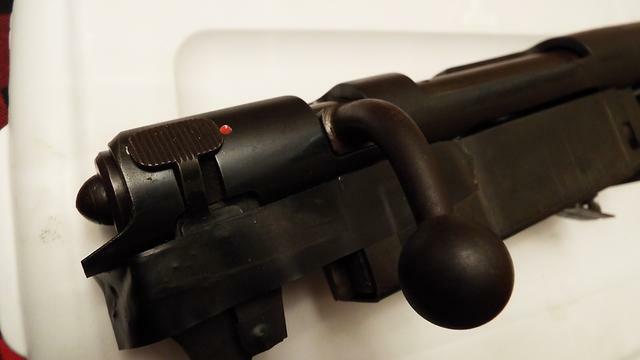 Some denoting caliber/gauges in other than 12ga, others having moved the takedown eustaceon pin to a different place on the stock and another pertaining to the safety lever. I don't think Sears even still honors the recall on these anymore because it has been so long now. I don't believe there's a problem with the way the bolt and retaining screw is on this gun. There are a few other little odd and weird quirks and surely not my first grab, but this was my winter project anyway. It's at least functional again and no longer missing half of it and laying in the dark corner of the basement for another decade. I admit though with as well as it shoots, I may enter it into the local turkey shoot this coming Thanksgiving. And I may even throw it over my shoulder for a squirrel hunt with my youngest son this September just to say that I did. The shotgun was carried under several product numbers: 583.13, 583.14, 583.15, 583.16, 583.17, 583.18, 583.19, 583.20, 583.21 and 583.22. 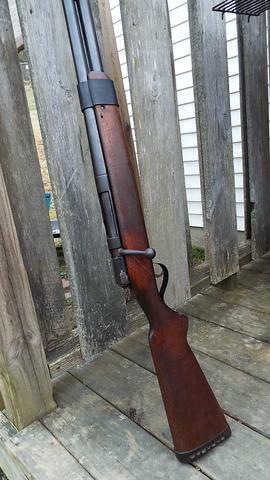 I think the model 583 that mine is, was likely made by H&R as the model 120. Schematic, parts interchangability, etc are all the same.